Hello, readers! Although we are no longer posting new items on our blog, we are keeping it available so you can browse through our past posts. Thanks for visiting! 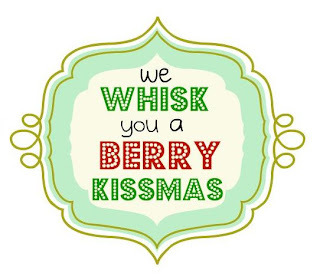 I'm sure everyone has seen the "we whisk you a merry kissmas" gift idea. That's right! 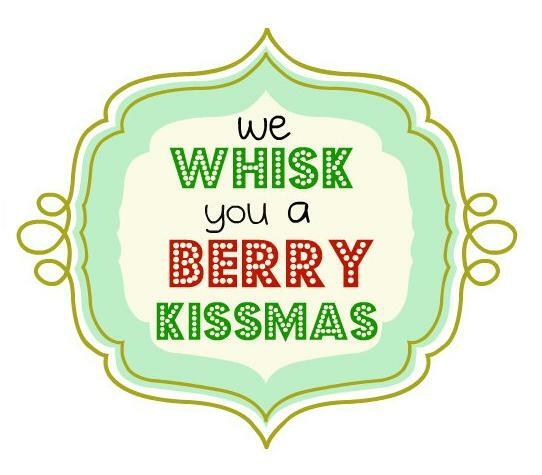 A "BERRY KISSMAS" my friends! It's fairly inexpensive to make...around $2.20 per gift, and it couldn't be easier to whip up! * Stick a handful of Kisses into the whisk and wrap tightly with the plastic wrap. * Secure at the top with a little tape. 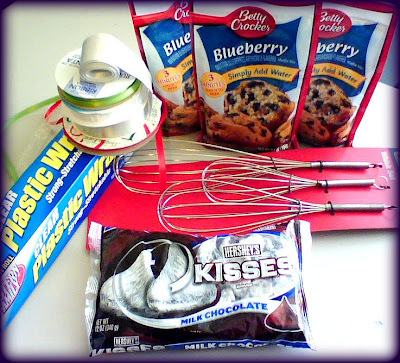 * Tape the wrapped whisk to the front of the muffin bag. 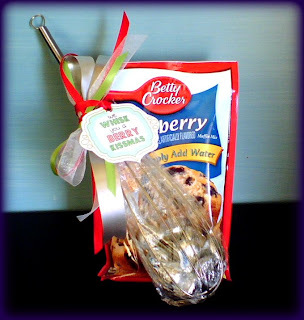 * Layer some ribbons and tie in a bow around the whisk handle. Please feel free to use the tag I created (up at the top). You can either save that single-tag image directly to your computer and print it in any program, or you can click the "Green Tags" link below. It will take you to a page of 6 printable tags, already created just for you! This is perfect!! I have been trying to figure out what to do for our neighbors...they are already giving to us...and this will be just perfect! Love your blog! Thank you, Thank you, Thank you!!! Thanks Tammy and Andrea. This is such a great idea. I still love your Chicken-in-a-basket idea from the white elephant exchange a few years back. I love your twist on it to add the muffins...yum! How cute! So much fun! I would love to get that as a gift! Thanks so much for linking! We are sisters, Tammy and Annie. We have bunches of bottled up ideas to be shared... so we joined the blogging bandwagon to share them with you! We love reading blogs about home décor, crafting, baking, and other fun stuff and we really like sharing (and sometimes straight-out-copying) other people’s great ideas... giving credit where credit is due, of course. But occasionally we like to create our own fun and we hope you’ll join us for the ride. We’re normal. We're refreshing. We know the correct use and spelling of the word VOILA.